by telephoning the surgery on 01623 842285 between 8.00am - 1.00pm Monday to Friday and 2pm to 6pm on Mondays. The surgery is closed in the afternoon except on Mondays. All emergencies will be referred up to our main surgery in Shirebrook. Once our appointments have been taken, patients may be asked to attend our main surgery in Shirebrook. 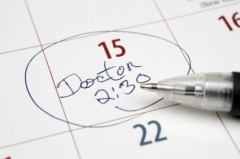 We cannot offer pre-bookable appointments to see the GP at the Church Warsop branch surgery. This is due to only being one GP on duty at all times. A limited number of pre-bookable appointments are available at Shirebrook. by telephoning the surgery on 01623 842285 between 8.30am - 1.00pm and 2.00pm - 6.00pm. Closed Wednesday PM from 1pm.